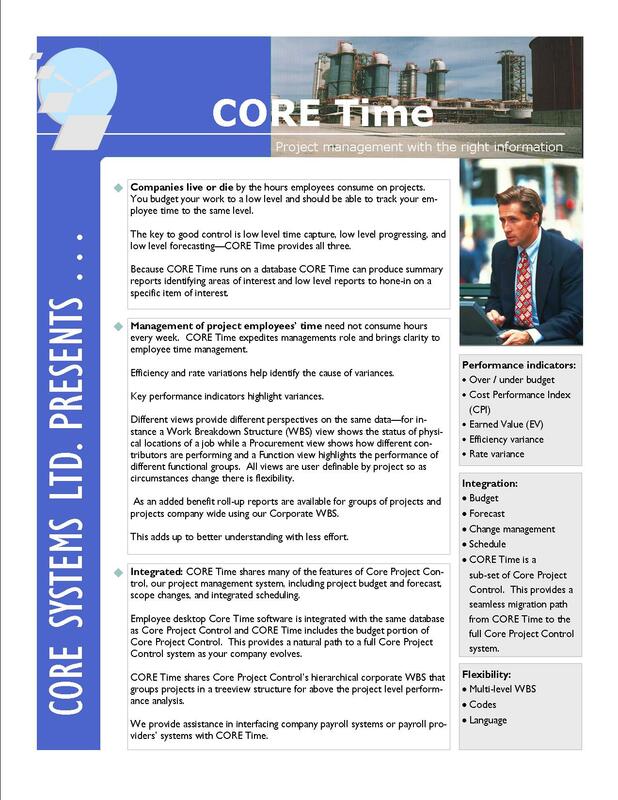 Solutions | Cost Control Software - Core Systems Ltd.
Over 20 years of project controls experience with some of the world's largest companies. on oil and gas, pulp and paper, and infrastructure projects ranging from a few million to over a billion dollars. Projects ranging from Engineering to full Engineer, Procure, Construct (EPC) projects in varied project and cultural environments. his experience is reflected in Core Project Control making it a solution worthy of consideration for your company. 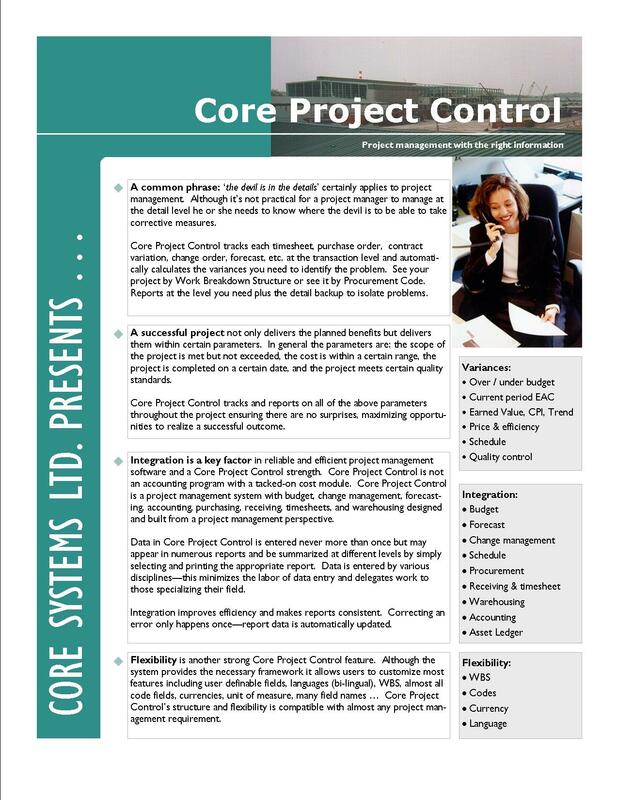 Core Project Control is a complete system for managing your business with original data entry screens for orders, timesheets, budget, etc. unlike many systems which require re-keying of data from other systems and subsequent periodic reconciliation of the systems. Budget, Cost Control, Change Control, Procurement, Receiving, Warehousing, Accounting and integrated Scheduling - all of the features you need to run successful projects are included. Click an image below to download pdf brochure. Core Project Control is built on Microsoft SQL Server - a recognized industry standard robust secure platform trusted by the worlds largest companies. Local access or site access through the Internet. Core Project Control can be installed on your servers or we can host the system on our servers. In either case the system can be accessed through the Internet via Terminal Server so both office and field personnel can be on-line. All features in one package running on a SQL Server database. Each user entering data, such as a PR, PO, timesheet, etc., because of integration is actually entering data into the cost system. This is a reduction in effort by all parties. For example PR data automatically appears in PO's so purchasing doesn't re-enter data. This is efficient and reduces errors.